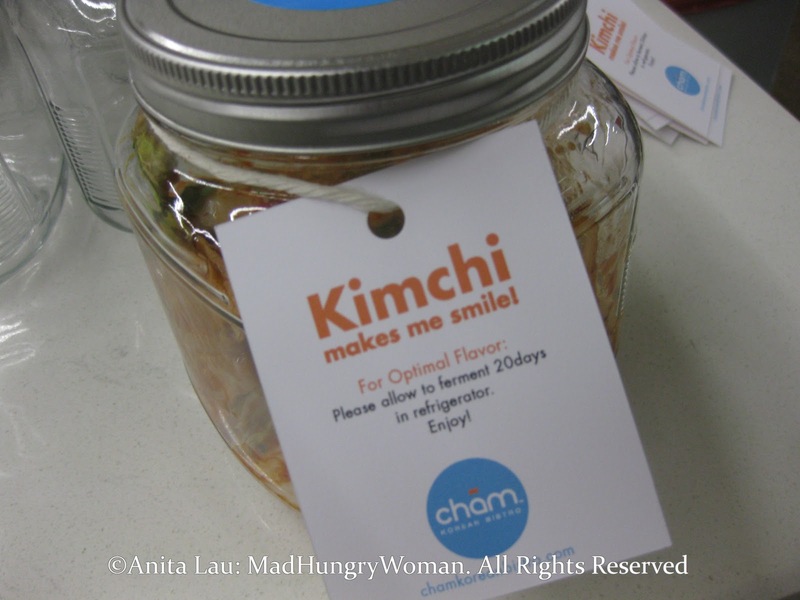 >Last month I was invited to a kimchi pickling event courtesy of Cham Bistro, a Korean restaurant in Pasadena. 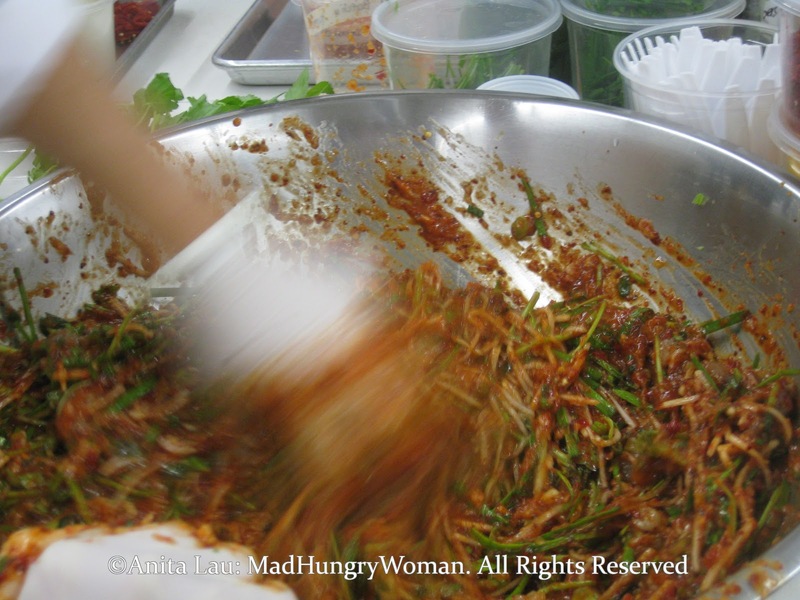 I’m an avid fan of kimchi and was very excited to learn how to do this the traditional way. For the purpose of this post, I will detour from my regular format and instead, use photos to show how this process is done. A recipe will be posted at the end of the article for those of you who are interested in preparing this. Napa cabbage is first soaked in salt water for an hour or two to soften the cabbage, so that it wilts the cabbage enough to later absorb the kimchi marinade. A puree of fresh chilis, onions, Asian pear, garlic and ginger is put through the food processor and mixed with chili powder and “sweet rice porridge” made with rice powder and water that has been previously boiled and cooled. 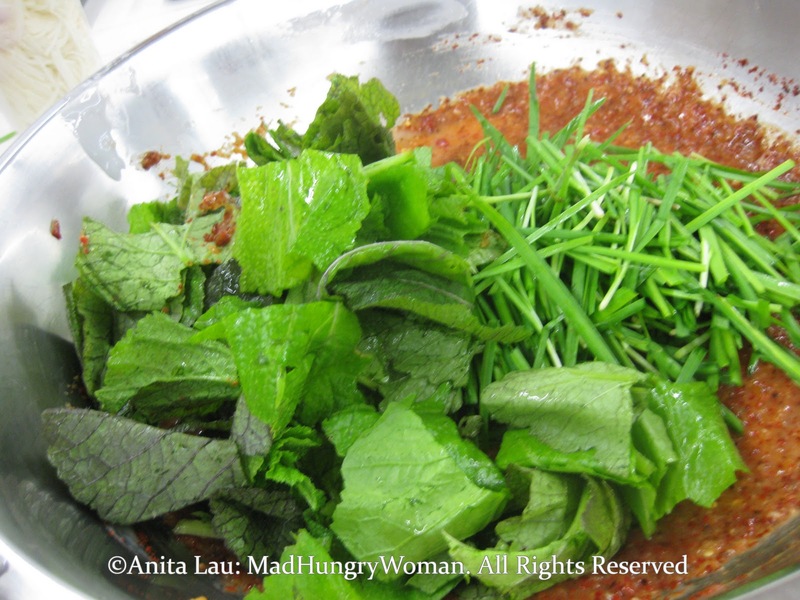 Once the wet mixture is completed, add in the radish, minari, red mustard greens, chives and green onions and mix thoroughly so everything is evenly incorporated. At this point, add in the important flavoring aspects which are the anchovy fish sauce, salted shrimp sauce and a mix of fresh and salted shrimp. Yes, RAW shrimps my friends! Give everything a really good mix, the best way to do it is the way shown in the photo, with gloves so you don’t have a case of burning hands when you’re done, and also, so your hands don’t smell like kimchi for weeks on end. When the mixture is ready, bring the napa cabbage to the mixing bowl and layer the mixture in between each flap of the napa, fold the napa in half and place into a glass jar with a good seal. 1. Trim the cabbage by removing any brown leaves on the outer layers. Slice the center of the cabbage’s stem 2 inches deep. Using your thumbs and hands, pull the cabbage into two sections through the slit. Repeat for the remaining cabbage. 2. Soak the cabbage sections in salted water (8 cups water to 1 cup sea salt) for 20 minutes. After 20 minutes, remove the cabbage from the salt water and sprinkle the remaining salt between each of the leaves. Return cabbage to the salted water with the cut side facing up. Rotate the cabbage every two hours, bringing the cabbage on the bottom of the container to the top and vice versa. After 5-6 hours, the texture of the cabbage will be properly rubbery. Wash the cabbage thoroughly and gently. Drain the cabbage in a colander, squeezing as much water from the leaves as possible. Set aside. 1. Combine the water with the sweet rice powder and whisk until smooth. Heat the water and rice powder mixture on the stove on medium-high heat, stirring occasionally to prevent it from sticking to the bottom of the pan. When bubbles start to form, reduce the heat and continue to stir. Once the mixture thickens and becomes translucent, take off the heat, approximately 10 minutes. Cool the mixture completely. 2. Place the onions, pear, garlic, ginger, and Fresno chilies in a food processor and pulse until finely minced. Set aside. 1. Take cabbage and stuff marinade mixture between leaves, working from outside in, starting with largest leaf to smallest. Do not overstuff, but make sure the marinade mixture adequately fills leaves. When entire cabbage is stuffed, take one of the larger leaves and wrap tightly around the rest of the cabbage. Divide cabbage among jars, pressing down firmly to remove any air bubbles. Only fill the jar 80% full because the kimchi will expand as it ferments. 2. Keep the jar tightly sealed and refrigerated for at least 20 days. >looks just like the way my mom makes.if you want to have fermented kimchi right away, it is okay to leave the jar outside for two to three days (no more than 3 days though) before refrigerating it.